On March 10, 2010, approximately 200,000 marched in Washington DC for immigration reform. Issues pertaining to women immigrants, "The Right To Liberty - The Right To Family", was a concern raised by many speakers and groups. Among the advocates in attendance for immigrants, and women immigrants in particular, was the United Methodist Women (UMW), which is the largest denominational faith organization for women with approximately 800,000 members whose mission, among other things, is to advocate for justice. UMW from 14 different UMW Conferences from across the nation attended the rally and march. The first two buttons depicted here are from that event. At Western Carolina University (WCU) the "Red Zone" is a term used to define a period of time early in the first or second year of college when students are more at-risk of unwanted sexual experiences and advances. The Red Zone Awareness Campaign seeks to convey the message that the WCU campus community will not tolerate sexual abuse. In this regard, each campus department seeks to sponsor programming to increase awareness of dating and sexual violence, while promoting healthy relationships. On March 8, 2000 women in over sixty countries were encouraged to go on "strike" to improve the world. Called for and promoted by the National Women's Council of Ireland, and supported by numerous other organizations such as "International Wages for Housework", the theme of the "Global Women's Strike" was to "Stop the World and Change It", with the purpose being to provide more of the world's resources toward the betterment of the lives of women and children, including such things as basic health, nutrition, literacy, education, and sanitation. Another Global Women's Strike was held in 2001, with both strikes coordinated to coincide with International Women's Day, a day recognized by women's groups around the world and also commemorated by the United Nations. The "I Love Babies" button was distributed at one of the recent March for Life rallies in Washington, DC, in this case 2010. The button is sponsored by Stand True Ministries, a Christ centered pro-life organization which seeks to activate young people all over the country to become more involved in their communities in spreading the pro-life message. Stand True sponsors such national events as the "I Don't Want My MTV Campaign", the "National Mother's Day Baby Shower", and the "Students Day of Silent Solidarity". People for the American Way was founded in 1981 by Norman Lear, a television producer noted for such shows as "All in the Family", "Maude" and "The Jeffersons". PFAW identifies itself as an advocacy organization which seeks justice and equality for all as well as the promoting the freedoms of religion and speech. The PFAW button portrayed here, "Save Choice - Save the Court", is a reference to PFAW's concern that recent Supreme Court appointees may overturn previous pro-choice decisions. On April 25, 2004 the National Organization for Women and others sponsored what was at that time felt to be the largest demonstration and march in American history. This was the March for Women's Lives which attracted between 800,000 and 1.5 million people to the National Mall in Washington DC. The rally participants focused upon the issues relating to reproductive freedom. The participants would march along Pennsylvania Avenue where counter-demonstrators, numbering a few hundred, lined a portion of the route. Chief among these were members of Operation Witness, an anti-abortion group founded in 1986. 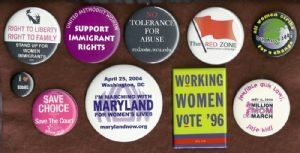 The button depicted on this page was sponsored and worn by members of Maryland's NOW, and reads, "I'm Marching for Women's Lives". The AFL-CIO was established in 1955 with the merger of the American Federation of Labor and Congress of Industrial Organizations. The AFL-CIO considers itself a champion for women in the workplace. In March 1996, the AFL-CIO endorsed the Presidential re-election bid of Bill Clinton, a Democrat, who went on to defeat the Republican candidate, Robert Dole. This "Working Women Vote" button was issued during that campaign. The Million Mom March was held on Mother's Day, a Sunday, on May 14, 2000 in Washington, DC. The purpose of the rally, which supporters say attracted over 750,000 participants to the National Mall, was to promote tighter gun control laws and restrictions. The main objective, according to organizers, was to promote "sensible gun laws" and keep guns out of the hands of kids and criminals. The event, which was promoted as a grassroots movement of mothers, was covered by all the major networks and many other news and television programs and talk shows. A counter-march and rally was also held at the same time. This was sponsored by "Second Amendment Sisters", an organization founded in 1999 by just five women. This group, which still exists, believes in the preservation of the Second Amendment, and that "gun control" holds out a false promise.